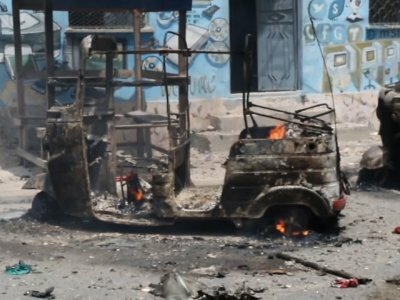 MOGADISHU, Somalia (AP) — A least nine people were killed in an attack on Somalia’s interior ministry and security forces killed all three attackers after a two-hour gun battle inside, police said Saturday, as the al-Shabab extremist group claimed responsibility. A number of people, mostly government workers, were trapped in the ministry on what had been a normal business day. Witnesses said some staffers died or were injured while leaping from windows or walls in an effort to escape. At least 13 people were wounded, paramedic Mohamed Adam said. The morning attack began when a suicide car bomber detonated at the gates of the interior ministry compound, which is close to the presidential palace and parliament headquarters and also holds the security ministry, police Capt. Mohamed Hussein told The Associated Press. The Somalia-based al-Shabab, an arm of al-Qaida, often targets high-profile areas of the capital, Mogadishu. The group was blamed for the October truck bombing that killed more than 500 people in the deadliest attack in the country’s history.